The 8th game in the Rock Fever series from IGS. Players must push the correct buttons in time with the cursor on screen. Rock Fever 5 features more than 50 new songs, and includes support for network connection. Rock Fever 5 also uses memory card technology, with players able to save their progress and unlock new songs. The 8th game in the Rock Fever series from IGS. Players must push the correct buttons in time with the cursor on screen. Rock Fever 5 features more than 50 new songs, and includes support for network connection. 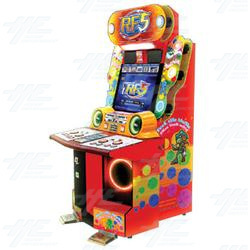 Rock Fever 5 also uses memory card technology, with players able to save their progress and unlock new songs.